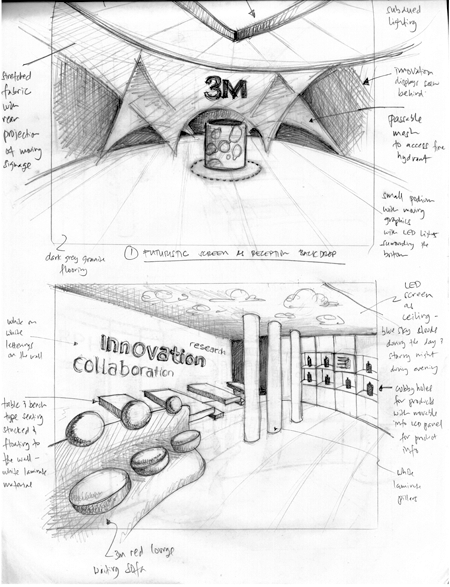 3M Middle East and Africa wanted to design and convert a 13,300 square feet of office floor into an Innovation Center. With more than 50,000 innovations and 10,000 products under their name, they want to showcase their very latest innovations and demonstrate how uncommon connections can result in unique solutions, getting visitors inspired and help their business develop innovative solutions with the help of 3M technologies. The virtual receptionist, triggered by motion, sets the tone of the visit. Individual interactive stations demonstrate 14 key technologies. Leading the pitch from concept to the final hand over, it was the 'Future in Motion' concept that won the account. Believing that sharing knowledge will benefit the society as a whole, we designed the entire floor into one enormous research laboratory where seemingly randomly placed products could trigger constant flow of curiosity, excitement and engagement among visitors. Sparking new ideas while they navigate throughout the facility. The concept revolves around the idea of Future in Motion. Every corner of the room, right down to the visitor experience path were designed to trigger a constant flow of curiosity, excitement and engagement. One can hope that the next big idea might come from one of their visits. Touch, hear, see and interact with 3M technologies. They will see, hear, touch and interact with all of the 3M technologies on a first hand basis and learn about their various applications in the exciting on-site teaching rooms, an entirely new experience for the region. 20-point interactive touch screens allow visitors to get inspired by 3M inventors and learn more about the 3M core technologies. Drawing more than 10,000 visitors per year since it opened, our design not only won the entire 3M portfolio but it was also lauded as the one of the best 3M Innovation Centers around the world. A total of 11 demo rooms were designed. Witness how deep sea drilling machines can withstand the immense pressure of the deep sea just by using glass bubbles to learning how a simple nano coating can save billions of lives in the medical field. One of my first few rounds of concept sketches. No details spared. The challenge was how to showcase all their existing 10,000 products and 50,000 solutions in the most engaging way. Final draft sketches of the approved concept. Here are my sketches closest to the final result. Provisions were taken to include modular designs where they can easily adapt or update any of the interactives by themselves.